​President Donald Trump has defended sending U.S. troops to the southern border with Mexico, citing national security concerns as a caravan of several thousand people approached the border. Since early this year, he has ordered varying numbers of U.S. active-duty and National Guard troops to help fortify the southern U.S.-Mexico border. April 4, 2018: President Donald Trump seeks to deploy National Guard troops on the U.S. border with Mexico, citing a “drastic surge of illegal activity on the southern border” that he says is threatening national security. April 5: In a memo, Defense Department Secretary Jim Mattis authorizes up to 4,000 National Guard troops but specifies they will not perform law enforcement duties or interact with migrants. The National Guard is made up of 435,000 reserve soldiers who can be called up by either the federal government or the states. Over the following weeks, the number of National Guardsmen called up to guard the border reaches 2,100. 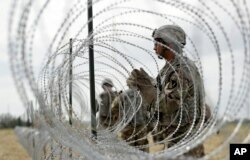 Members of a U.S Army engineering brigade place Concertina wire around an encampment for troops, Department of Defense and U.S. Customs and Border Protection near the U.S.-Mexico International bridge, Nov. 4, 2018, in Donna, Texas. Aug. 31: The National Guard mission at the southern U.S. border is extended for another year. Oct. 18: As a caravan of migrants begins marching toward Mexico and the U.S., Trump threatens in a tweet to send troops to the border. Central American migrants begin their morning trek as part of a thousands-strong caravan hoping to reach the U.S. border, as they face the Pico de Orizaba volcano upon departure from Cordoba, Veracruz state, Mexico, Monday, Nov. 5, 2018. Oct. 25: The Department of Homeland Security requests additional troops at the border and the Defense Department is expected to deploy 800. Oct. 29: The U.S. military says it will send more than 5,000 troops to the border. Oct. 31: Trump says he could send as many as 15,000 troops to the border. "As far as the caravan is concerned our military is out, we have about 5,000-8 (thousand), we'll go up to anywhere between 10 (thousand) and 15,000 military personnel on top of border patrol, ICE and everybody else on the border." Nov. 2, 2018: The Pentagon resists a White House request for troops to serve as law enforcement on the border. Instead, they are ordered to do tasks that suport border authorities, such as laying razor wire. Pedestrians pass members of the U.S.military working to place razor wire along the U.S.-Mexico border on the McAllen-Hidalgo International Bridge, Nov. 2, 2018, in McAllen, Texas. Nov. 15, 2018: The troop deployment at the border tops out at 5,800. "We're pretty much peaked in terms of the number of people that are down there," Deputy Secretary of Defense Patrick Shanahan told reporters at the Pentagon. Dec. 15: Military mission at the border is scheduled to end, unless it is extended.